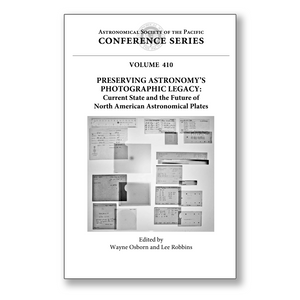 Astronomers interested in using archival photographic plates in their research and institutions charged with preserving and managing plate archives will be interested in this volume. Included are the results of a workshop held at the Pisgah Astronomical Research Institute (PARI) in November 2007. The workshop consisted of a series of debates and in-depth discussions on the topic of astronomical plates that culminated in recommendations for preserving astronomical photographic data. This book has two main parts. The first is a detailed account of the PARI workshop, whose discussions covered a wide range of issues that must be considered by any institution involved in archiving plates. The resulting recommendations on preserving, cataloging, and making publicly available these irreplaceable photographic data are presented along with the progress to date on implementing them. The book's second part presents the results of a census of astronomical plates in North America carried out in 2008. The number of plates and their current conditions and locations are provided as well as the contact information for those responsible for all the identified plate collections. The main articles are supplemented with invited essays and other material that address such topics as the perspective of the International Astronomical Union on the importance of data archiving, PARI and its new Astronomical Photographic Data Archive, recent initiatives to digitize astronomical plates, the evaluation of two commercial scanners for plate digitization, an example of a research project that is entirely dependent on the availability of the older photographic data, and a summary of some of the parallel initiatives on plate preservation and digitization underway in Europe.